During the season of Advent, our church has focused Sunday worship and Wednesday studies on Mary, Joseph, and Elizabeth. Each of these people responded in faith, and their openness to unexpected possibilities helped bring about the arrival of John the Baptizer and Jesus. As my wife, Lisa, said during her sermon on Sunday, we know the end of the story – that everything turned out beautifully – but these people did not know the ending. And yet, they responded in faithfulness. Certainly, Joseph’s faithful response was incredible. After learning that Mary was pregnant, Joseph had a dream. Joseph was told that the child was to be called Emmanuel, which means “God is with us.” Joseph likely knew the origin of the term, which came from Isaiah’s prophecy to King Ahaz many, many years before. Originally, the word was spoken to Judah’s King at a time of great upheaval. War had been declared on Judah, the Southern Kingdom, by the Northern Kingdom and Syria. King Ahaz wondered how he should proceed and was given a word of the Lord through the prophet Isaiah reminding him to put his trust in God rather than military force. Emmanuel was a word spoken to the people reminding them of God’s presence with them and God’s provision for them even in uncertain times. 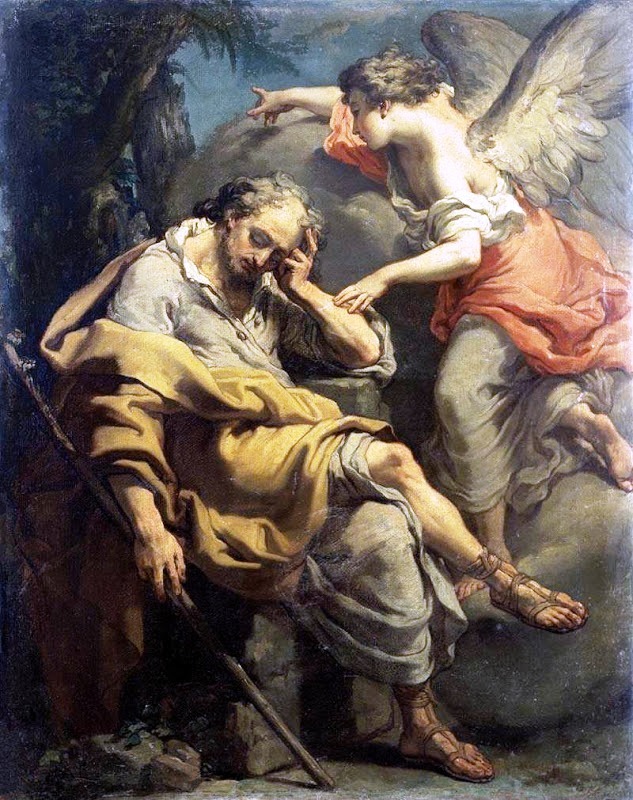 For Joseph, however, it became a deeply personal word – God is with us – in the midst of tremendous uncertainty and personal turmoil. The great word of the Lord became the promise for Joseph. There are times when the great words and convictions of the faith may become personal for us. Perhaps, you find yourself needing reassurance that God is with you as you face a variety of challenges during these days. May you sense God’s presence in real and powerful ways during the remaining days of Advent. And, may you know that God is with you. This entry was posted in Uncategorized on December 16, 2013 by Dean Allen. During worship at our church on Sunday, we celebrated the first Sunday of Advent. 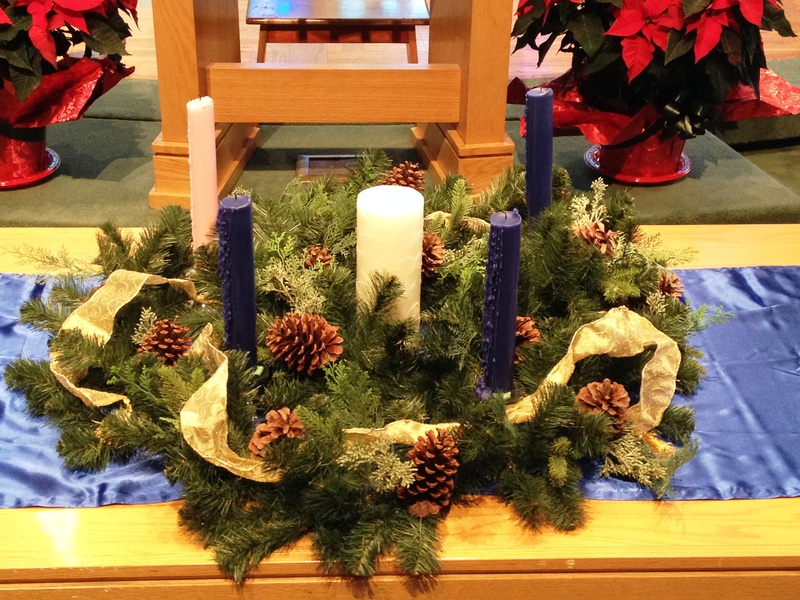 As we do each year, we used the Advent Wreath as a way to mark the Sundays before Christmas. During worship, I shared a story about the origin of the Advent Wreath. Pastor Wichern wanted to help the children learn when Christmas would arrive, so he took a wheel from a cart and attached four large candles to it. One candle marked each Sunday in Advent. Between the Sunday candles, he attached smaller candles for weekdays. He would light one candle each day during Advent. By watching the candles burning, children learned when Christmas was coming. In later years, Wichern attached pine boughs as a reminder that God offers new life through Jesus Christ. In our worship, we light one candle each of the four Sundays during Advent. Three blue candles remind us of Peace, Hope, and Love. One pink candle reminds us of Joy. In the center, a large white candle is the Christ Candle, which we will light during our Christmas Eve service. I hope your Advent will be filled with Peace, Hope, Joy, and Love. This entry was posted in Uncategorized on December 2, 2013 by Dean Allen.